On Saturday Feb 27 a few of us gathered for WorldWide SketchCrawl 26 at the Washington State Convention Center. Weather was drizzly and sunny in turns! We had the best of both. 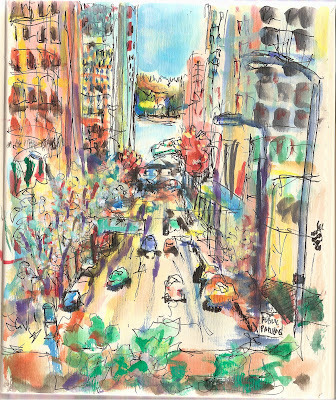 Here's my sketch looking down Union Street to Elliott Bay, from the balcony on the second level. I love the loose quality of this. The colors and style make an impressionist view of the city. This is great! Beth, I really like this image of downtown. It captures the spirit. So much action! Love it! terrific. I love your wild style. I mean that in a good way. very exciting drawing.